Whenever I post to social media a picture of a black man, woman, or child dangling lifeless at the end of a rope during the 20th Century, often with a large group of white men, women and children standing nearby–smiling–the first thought that usually enters my mind is “how many of these lynchers are still alive?” That question is typically followed by my own solemn knowledge that for the ones that took place from the 1930’s to the 1960’s, that some of those participants are still walking, talking, and breathing clean air among us all. Whenever I think about the fact that there are murderous terrorists among us that committed barbaric crimes with impunity, I realize how little power black people, in the collective, have on swaying governmental entities to investigate, prosecute and condemn to prison or death those whites whose acts were easily heinous, atrocious and cruel to their black countrymen. Before entering law school, I earned two degrees concentrating in history and unknown to many, while Black History is a subject in which I am well versed and love to share, my true area of focus then–and real gift as far as depth of knowledge and understanding–is modern European History in general, and World Wars I and II through the end of the Cold War, in particular. Included within this is a study of and respect for the Shoah, or the Holocaust–the systemic government (Nazi) persecution of Jewish people in Germany and at the outset of World War II, Jews (and to a lesser extent Gypsies, Africans and homosexuals) in German occupied territories. Of the many figures that I have studied and come to admire through my years of study, perhaps one of my favorite 20th Century figures is none other than the late Simon Wiesenthal. Wiesenthal, born in the old Austro-Hungarian Empire in 1908, was a professional architect prior to the Second World War. When Germany invaded Russia in the summer of 1941, Wiesenthal was soon rounded up with other Jews and found himself toiling to survive in six concentration camps before war’s end. After being liberated by American soldiers from the Mauthausen Camp on May 5, 1945, Wiesenthal dedicated the remainder of his life to bringing Nazi war criminals to justice. Wiesenthal’s indefatigable efforts led to the arrest of over 1,000 Nazis, including Colonel Adolf Eichmann, the so-called architect of the “Final Solution” that led to the murder of over 6 million Jews, Gypsies and other non-Aryans. The very fact that Eichmann swung from the gallows in 1962, a full 16 years after infamous co-conspirators like Heinrich Himmler, Joachim Von Ribbentrop and Herman Goering died by hanging or suicide following their convictions during the Nuremberg War Tribunals, proved that Wiesenthal’s chief aim, that murderers pay the price for their sins, worked. I invoke my admiration for Wiesenthal this morning because while the world well knows his efforts and the fact that many Nazis were hunted down and prosecuted for their crimes even into the 21st Century, there has been little to no progress on hunting down and prosecuting those American whites who terrorized and killed Blacks throughout the 20th Century. Sure, there have been a couple of successful late in life prosecutions, most notably Byron De La Beckwith’s trial and conviction for shooting civil rights leader Medgar Evers in the back as he walked toward his front porch in Jackson, Mississippi in 1963. But there have been few active prosecutions relative to the scope, frequency and magnanimity of the crime of lynching during this era. I strongly suspect that part of the modern hesitancy to prosecute is merely an intellectual recrudescence of the federal government’s failure to enact any laws that would have protected innocent blacks from being lynched by their white neighbors during the lynching era. Of the 200 measures proposed in Congress over a seventy year period, proposals that met with the support of seven US presidents, perhaps the strongest was one proposed by Missouri Republican Rep. Leonidas Dyer in 1923. Dyer’s Anti-Lynching Bill would have made it a felony for any person to commit the crime of lynching, including public officials. See, it is crucial to note that more often than not, local government officials from the Sheriff to local mayors and city officials either were complicit in allowing white mobs to abduct blacks from jail cells to be lynched, or in some instances, were actively involved in the planning and implementation of these savage killings. Cognizant that local and state officials in the South and parts of the Midwest were unwilling to stop lynchings, the NAACP, founded in 1909 for the primary purpose of eliminating lynchings in America, supported Dyer’s Bill, one that would have included a minimum 5 years imprisonment for those so charged, a $10,000.00 fine, and fines for the counties in which the practice took place. President Warren G. Harding offered his support of the Dyer measure but again, the Southern Democratic bloc rebuffed the effort in Congress in 1923 and 1924. Invariably, lynchings went on for an additional 40 plus years en masse with little impunity for the perpetrators. Unlike some historical observers who suggest that the last recorded lynching was the hanging of Michael Donald in Mobile in 1981, I tend to draw a straight line from lynchings to more recent racially motivated murders like James Byrd’s death at the hands of white supremacists in Texas in 1997, and failures of the system with respect to Martin Lee Anderson, Sean Bell, Trayvon Martin, Jordan Davis, Jonathan Ferrell, Eric Garner, Mike Brown, Tamir Rice and countless others. 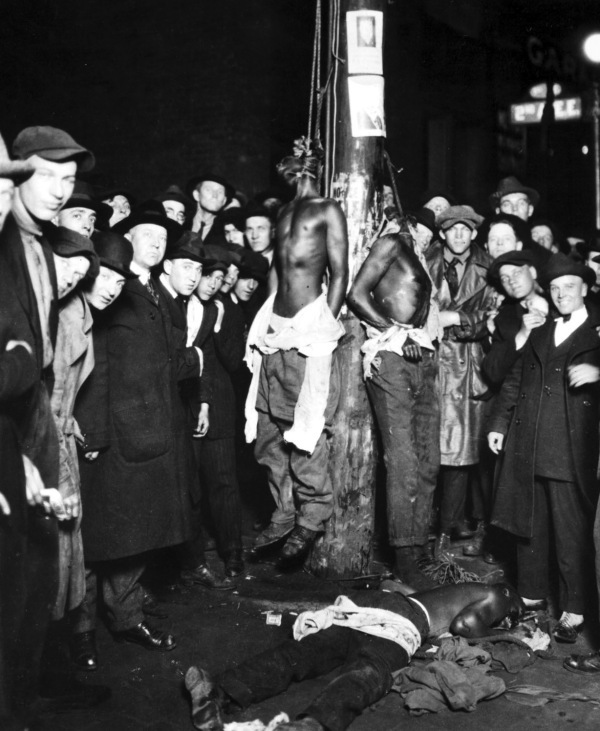 I do this because nowhere in recorded history has a black lynch mob ever tortured and murdered in public–replete with pictures–any white man, woman or child. I do this because when blacks were lynched back in the day, grand juries refused to indict any whites for their deaths; when blacks are killed by vigilantes and police officers today, justice is slow or completely non-existent. Lest we forget….